I can’t believe how much has happened in just a few days. I went to my mums friends 40th birthday party on Saturday night and on the way there, we saw a man running in the road and jumping on the bonnet of a car! He was shouting like crazy and it looked like he was trying to tear his own face off! I think it must have been drug related, it was quite scary to watch to be honest, especially so close to home. But that’s just the start of the drama this week. I went to see my midwife to finish the Birth Plan on Tuesday, she did my blood pressure and said it was quite high, and there was also traces of protein in my urine, then she checked my measurements and felt for Charlie. He’s in the 90th percentile which means he’s a lot bigger than the average baby. Worrying. She did my blood pressure again and it was still high so she said I had to go straight to the hospital! I went up to triage with my mum and we were there for hours. I was on a bed with straps around my belly, listening to Charlie’s heartbeat. But because he kept moving around, my mum had to sit there holding he Doppler in place. I had a blood pressure strap around one arm that pumped up and took a reading every 15 minutes, and a button in the other hand that I had to press every time I felt Charlie move. It was quite uncomfortable hand Charlie got hiccups so the readings were really high for movement! Because my blood pressure was high and then low and then high, they said it was fluctuating, so they took some blood from me and some more urine, we sat waiting for the results for ages and they ended up sending me home saying that all the blood were fine and that if there’s anything wrong with e urine they’ll call me. So we assumed everything would be fine and went home. A few hours later we were at the Antenatal Class. Getting sick of the hospital already! Haha. The class was good though, we put nappies on dolls and talked about all the things that might go wrong during birth, and different types of assisted labour, like the forceps and vacouse thing. They all sound pretty horrible but I suppose it’s better to know as much about it in advance than be shocked when the time comes. We also went on a tour of the Labour Ward. There’s two different sections where you can give birth. It depends on if you’re high or low risk. The high risk rooms are for if you’re being induced or if there are any complications during labour or birth that needs extra attention. The rooms are nice, but quite clinical and I don’t imagine you’d feel completely comfortable in there. The low risk rooms are amazing! They’re really big, with a bed in the corner where the gas and air is and an iPod dock-in station. There’s a birthing pool on the other side of the room, again with gas and air nearby, a huge bean bag bed type thing on the floor a bit further up, an en suite toilet with a walk in shower, glass doors leading outside onto your own little patio area and mood lighting that changes colours on the ceiling! I can’t express how badly I want one of these rooms! The morning after this, I noticed that I had floaters in my eyes that I’m sure I hadn’t had before, so I spoke to my midwife who said I should call triage. When I did though, they told me they were just about to call me themselves because somehow my urine sample became “contaminated” and they need another one. So I took one up later in the day, just to get a call telling me I need to go back in on Friday because there’s still too much protein in it. The woman said to keep calm and not worry, but that’s easier said than done isn’t it? Friday started off the same as my trip to triage, just having my blood pressure checked every 15 minutes or so, it was still fluctuating so the doctor sent me in for a scan to check on Charlie. 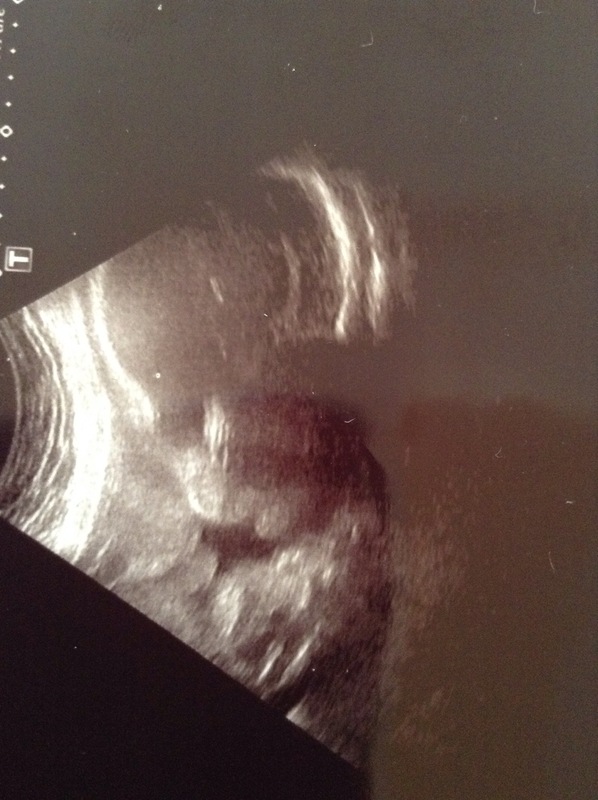 He’s so big now that it was difficult to get a decent view of his entire body on the screen, but the woman showed us his face! It was pretty special, and it looks like he’s got cute little chubby cheeks too! They’re guessing that he weighs about 7lbs 8oz! According to Emma’s Diary he’ll grow by about 1 pound each week until I give birth, so by my due date he’ll be about 11lbs! They say it’s never 100% accurate, so I’m hoping beyond hope that it’s not! Haha. After the scan I had to be strapped up to a machine listening to Charlie’s heartbeat again, which was all fine. Basically, Charlie it totally fine, it’s just me that’s mysteriously ill. I say I’ll, but I feel totally well in myself, which was a bit frustrating. The doctor decided to admit me for the night, and check my blood pressure every 4 hours. I was a bit nervous because I’d never stayed I’m a hospital overnight, I knew I’d have to when Charlie’s here, but now felt too soon! My mum took me to the ward and got me settled before she left to bring me some stuff up for the night and next morning. When I got to my ward, I was put in a bay with 4 beds in it, there was a woman in the middle of a contraction on one of the beds when I got there. She was really nice. Felt a bit sorry for her though, because her husband didn’t seem very caring at all. He just ignored her most of the time, she was in pain during contractions and he just played chess on his iPad! I was texting Paul while I was there, telling him about it all and he said it sounded like I was giving him examples of what not to be like haha. I guess I was! Paul was surprisingly sweet too. He seems really worried when I told him I had to stay in and immediately asked if I wanted him to come to me. I told him there’s no point, I’m just going to be sat there getting my blood pressure done every 4 hours, it’d just be boring. Plus by the time he got trains and taxis here, it’d be about a half hour before he got sent home when visiting finished. So he offered to send me money or buy me books for my kindle. He said he’d stay awake all night and talk to me if I couldn’t sleep in there. I said I know perfectly well that he was going to be up all night anyway, because it’s he launch day of FIFA 15 and he’ll be addicted to it haha. He was still really nice though, and it made me feel happier and more relaxed. Maybe he’ll be a brilliant birth partner after all! Not long after I got there, the woman having contractions waters broke, and she felt sick and threw up a few times. She kept apologising to me! I told her not to be silly and got her some water and waited with her till the midwife came to see to her. Her husband had just popped out to find something for his lunch, typically. When he came back (not very pleased that he didn’t have time to eat his sandwich), they went down to the labour ward to have their baby. I shouted good luck at them as they left and the woman started crying and I heard her say “oh she was so nice!” as she was wheeled down the corridor, which was lovely. Another woman came in later on, her waters had broken earlier that morning but nothing else had happened so they’d set her an induction time for the next morning, and she was expecting to just sleep in the hospital that night. Her and her husband were talking about him leaving at 8pm when visiting hours ended, and about someone looking after their other two children, when her contractions suddenly started. I’m not joking when I say this, it was less than an hour and a half later when she got taken down! It went so fast it was unbelievable! She was saying she felt like she needs to push as they took her away. I can only hope mine is that fast! I was quite impressed with the whole hospital experience too. It was probably so nice because it was the maternity place. All the midwives seemed genuinely happy all the time, it must be a nice job. I literally didn’t see any miserable ones or anyone that seems tired or a bit fed up. They were all lovely, even the cleaners and other staff. All happy and smiling. I slept well too, the bed moves into all different positions and once I found a nice one I was so comfortable I couldn’t stay awake for long. They had to wake me up at 2am to do a reading, but they didn’t wake me at 6am because they thought I needed the sleep more, and they just took it when I woke up after 7am. The same doctor I’d seen the day before came to see me again around 9am, and because all the midwives had been in and out checking on me (the ward was strangely quiet, they said it was because I seem to have an effect on women that sends them into labour quicker haha) they came to listen to what was gonna happen next too. He said that because it’s still fluctuating it’d make more sense to induct me next week! 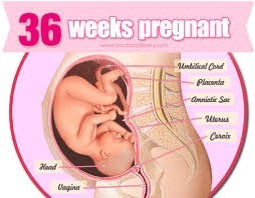 At 37 weeks, your baby is classed as fully term and it’s perfectly safe for them to come out, and because they couldn’t pinpoint a reason why my blood pressure is acting the way it is, he thinks the best plan is to induce me when in 37 weeks. I was terrified and I think it showed on my face because midwives kept hugging me. The thing I was most worried about was my hospital bag. I kept thinking my due date was ages away so I didn’t need to get it ready yet. I was going to do it on Tuesday but got sent to triage instead, then I was going to do it on Friday and ended up having to stay overnight in hospital! It was like I wasn’t meant to get it done at all! The doctor said to come back on Monday to get rechecked and we’d go from there. I called Paul, who was still half dead after playing FIFA till about 4am. He was a bit freaked out too, naturally. Because I was so emotional and couldn’t stop crying I asked if I could go see him and he said yes. I had to wait to be discharged and my mum came to pick me up, everyone else got really excited about me being induced, which I guess was nice, but I was still quite numb and shocked. I felt a lot better after being with Paul though. It’s like we both kind of new this would be the last time we’d see each other in this situation. The last time it’s just the two of us. Everything changes when Charlie comes. Despite all the arguments on and off and how we are with each other, I had a great time. His parents came round too, and his mum was really lovely saying that if I ever want a rest I can just turn up at her house and she will take care of me and Charlie and that I can go sleep in her bed or just relax, whatever I want. She kept feeling my bump and saying she feels bad that we haven’t seen each other much because we’re going to be a family very soon. She made me feel great too, and I know that when I go down with Charlie every weekend, regardless of mine and Paul’s private situation, the rest of his family will be glad to see me and Charlie. It’s very relaxing, especially since I wasn’t aware I was so stressed about it! Me and Paul acted just like we used to, it was like we were a couple again which was quite nice. I don’t know what’s going to happen in the future, but I like to think that me and Paul can stay close whatever comes, and Charlie will be surrounded by family members that totally adore him. I’m not scared anymore. I can’t wait to meet my son and start my new life with him. This entry was posted in Pregnancy, Prose and tagged 36 weeks pregnant, baby, birth, fear, labour, life, love, pregnancy, pregnant. Bookmark the permalink.